"I want to sell my house fast!" It's a common plea we hear from our sellers. 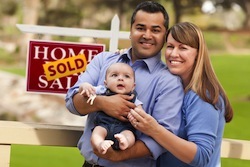 What factors into making a home sell more quickly? First impressions are one of the most powerful sales tools. Emotion plays a tremendous part in creating an interest in your home from a potential buyer. Make certain your home puts its best foot forward and that you follow these time tested tips for selling your home fast. Invest in landscaping where it can be seen at first sight. A well manicured lawn, neatly clipped shrubs and clean walks create a good first impression. An extra shot of fertilizer, in season, will make your grass look lush and green. Cut back overgrown shrubbery that looks scraggly and keeps light out of your house. Paint your house if necessary. This can probably do more for sales appeal than any other factor. If you decide against painting, at least consider painting front shutters or window and door trim. Walks should be free of leaves, weeds, dirt and debris. Inspect the roof and gutters, and replace any missing shingles. Consider pulling flowers outside the front door. Put a bright coat of paint on your mailbox (or replace it). Put a new doormat out front. Clean your cabinets inside and out. Clean the vent hood, the range/oven and the sink. Remove any extra appliances and/or knickknacks on the counters that you dont use every day. Unsightly bathrooms can be a real showstopper for many prospective homebuyers. Do some basic maintenance and simple tweaks to make your bathrooms sparkle. Repair any dripping faucets; they discolor sinks and suggest faulty plumbing. Keep fresh towels in the bathroom. Scrub the toilet, shower, tub and caulk if necessary. Use drain opener to unclog any slow drains. Staging involves deeply cleaning, decluttering, depersonalizing and arranging furnishings to make your house as appealing as possible. According to a survey by the International Association of Home Staging Professionals and StagedHomes.com, 95% of staged homes sell in 23 days or less, on average. The goal is to make the home look ready for a professional magazine-style photo shoot. Have all drywall in good shape. Cracks and nail holes are easy to fix. Check ceiling and ceiling fans for dirt. When painting or redecorating, stick to conventional colors. Replace faded curtains or bedspreads. If you have a fireplace, clean it out and lay some logs inside. Wash your windows inside and out. Replace or fix any torn screens. Check all light bulbs and replace if necessary. Check light switches and plugs to make sure they work. Make sure all floors are clean. Straighten all closets; well ordered closets show space is ample. For sliding doors that stick, rub paraffin wax in the tracks. Clean the air return vents and put in new filters. Don't neglect the hidden utility areas of your home. Clean and organize the garage and attic and dispose of anything you will not take with you. Repair any major cracks with ready mix concrete. Check garage door and oil if necessary. Keep shades open to let in light; this makes your rooms look larger. Have your home well-lit and interior doors open for showing. At night, turn on porch light and any exterior lighting. Make sure all beds are made and rooms cleaned daily. Make sure all dirty dishes are in the dishwasher, not in the sink or on the counters. Keep toys in the kids room. Try to run some errands when the house is being shown. If you are home, do not negotiate directly with the buyers. Refer any inquiries about your home to your Realtor. Take your pets for a walk when your house is being shown. Let the Realtor show your house and do not tag along. What have you done to help get your home ready to sell quickly? Share your tips with us in the comments!